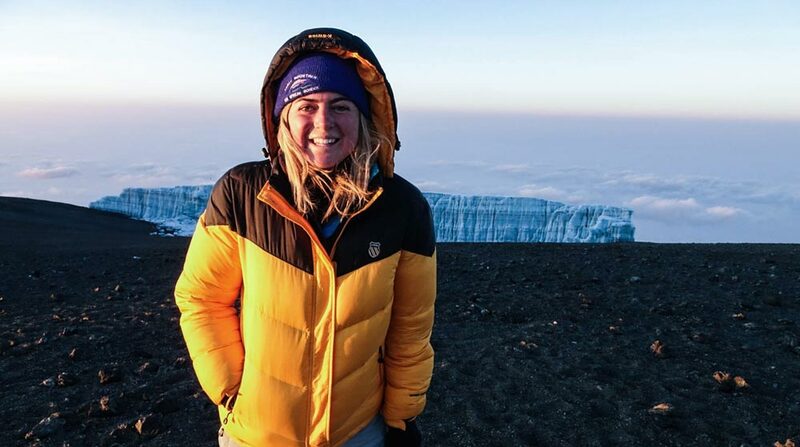 Serendipity has followed travel journalist and filmmaker Brooke Bierhaus around the world, including to Africa’s highest peak. We looked up as the loose rocks crumbled down the side of the mountain above us. I jumped to the side of the trail as the small stones settled feet away from my dust-covered boots. My guide picked up what looked to be a huge sandstone, took out his tattered bandana and wiped off the dirt. Even in its raw state, the exposed unpolished crystals sparkled under the harsh afternoon sun. This was the third stone to manifest itself in my path in the last three months. I could no longer ignore the idiosyncrasies the universe kept throwing at me. I held the rock for the entire trek back down to the town of Lalibela, Ethiopia; my fingers enclosed the rough edges like a beautiful secret. Before this crystal, a polished (and obviously lost from a necklace) jade stone caught my eye while trail running in Boulder, Colorado. Before that jade stone, a black onyx stone hit me on the head in Merzouga, Morocco. What was the universe trying to tell me? With that advice in mind, I continued on my path, but set my sights higher: 19,341 feet high, to be exact. Climbing Mount Kilimanjaro had always been a dream of mine. From the age of 8 I had adopted a love of Sir Edmund Hillary and Everest climbing novels, and a fascination with being above the clouds. However, it was not Everest or K2 that I felt a calling to summit. No, it was the magic of Kilimanjaro that always begged to be my first high-peak ascent. Starting in the rainforest, crossing through semi-desert, alpine desert and eventually reaching the ice-capped, glacier summit — the views are mesmerizing. I had planned the climb months in advance with a friend who would meet me in Moshi, Tanzania in late September. Circumstances arose, and days before our start date, she had a horrible cough and fever (which later turned out to be a bacterial lung infection). Knowing full well that her body was not up for the climb, I ended up climbing solo with my guide Dixon, a team of four porters and the best cook on the mountain. The seven-day Lemosho route trek is unanimously the most beautiful and diverse route of the seven established mountain routes. Starting in the rainforest, crossing through semi-desert, alpine desert and eventually reaching the ice-capped, glacier summit — the views are mesmerizing. The day of our summit ascent, we planned to leave camp by midnight. My excitement, mixed with the numerous hot cacao drinks I had consumed that evening, left me unable to fall asleep. My mind raced with the facts and figures surrounding a summit push up Kilimanjaro. There is only a 65 percent average success rate across all routes of climbers who reach the summit. The Lemosho route has an 85 pecent success rate out of the thousands of climbers from around the world who climb a year. As I reassured myself of the daily training I had put myself through leading up to the climb, I began to still my racing mind. Morning runs in the Serengeti heat, bodyweight circuits, running through Mwanza town with security guards — I was ready. I had barely slept two hours before one of my favorite porters, Richard, was outside my tent with a bowl of uji, a Tanzanian porridge made from teff. 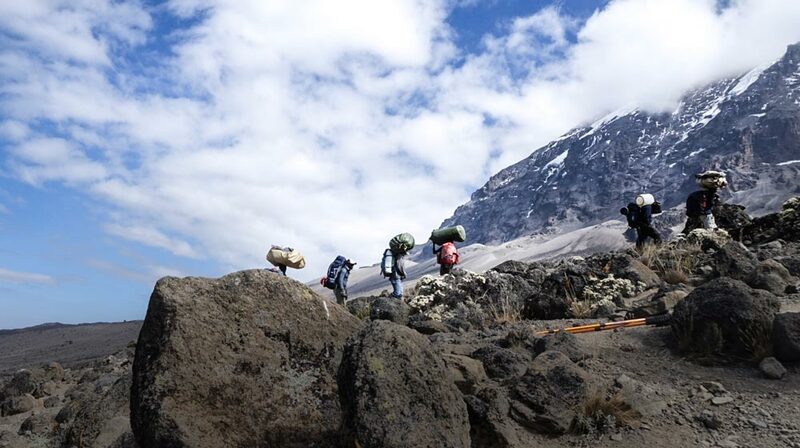 A typical ascent from Barafu Camp (altitude 4,673 meters) to Uhuru Peak (5,895 meters) takes an average of seven hours. Both Dixon and I felt strong on the climb, and with our steep scramble shortcuts to bypass the larger climbing groups, we found ourselves 175 meters from the summit in a matter of four hours. While this might seem like a good situation, we were in total darkness and two hours from any sign of sunshine for heat and light. As a photographer, part of the allure of reaching the summit was to take photos. Why not just stay on the summit and wait for the sunrise? you might ask. The altitude and lack of oxygen at 19,000 feet can be detrimental after 30 minutes. Here we were at 18,888 feet, numbingly cold, two hours from sunlight and breathing in thin air. At first we found a thick rock to block the howling wind and sat down to rest. However, I was too cold to sit and had to keep moving to stay warm. Our next hour of climbing was painfully slow, but truthfully, it will forever be my favorite hour of climbing on Kilimanjaro. I could hear my labored breath, watch it circle around the light of my headlamp with every exhale. I could hear the stiff rocks crush beneath my boots and smell the crisp, dry air. The stars lit up the mountain’s ridge as I turned to look down the mountain. The view behind was just as breathtakingly beautiful as the view in front of me. The string of headlamps, nearly 100 little lights moving in harmony up the mountain, contrasted with the complete darkness that engulfed me. It was not the lights themselves that struck me as beautiful so much as the reality of how hard each one of those climbers was pushing their mind and body at that moment. Gratitude settled into every step I took there on out. Gratitude for a strong capable body, a powerful will and the ability to travel to accomplish this climb. The first glimpse of light rose above the clouds in a dark pink hue. My eyes watered from the wind, from the cold, from the adjustment to the new light — from the sheer awe of it all. There I was at the highest point in Africa, in the midst of a dream turned reality. I walked past the wooden Uhuru Peak sign being celebrated and photographed by some of my fellow climbers from the morning’s ascent. I looked out above the clouds. I thought about what the man at the airport had told me — “you need to start looking up more.” I turned my gaze upward, and just for good measure, looked down at the iced volcanic rock beneath me. I slowly picked up a fragment of the black jagged rock, and placed it in my down jacket pocket. You are my reminder to stay grounded, I thought, regardless of how high I set my sights. Brooke Bierhaus is a University of Iowa School of Journalism alumna currently working as a documentary filmmaker and broadcast journalist. Her work in the two years since graduation has taken her to 21 countries on five continents. Brooke focuses on narrative-driven visual storytelling with an emphasis on human rights. To view some of her work, or to contact Brooke, visit www.vidbee.org. This article was originally published in YogaIowa’s Winter 2018 issue.